NEC 55" LED Touch Screen by Tech Global Inc.
NEC X series professional LED backlight LCD displays are an incredible 1.7" thin integrated with a seamless high-performance touch system brought to you by Tech Global Inc. the leader in state-of-the-art high-performance touch solutions! Aug. 3, 2011 - PRLog -- Tech Global's (TGTDST-X461S-3) & (TGTDST-X551S-3) NEC LED X-series touch screens are just 1.7" deep. The NEC X series is integrated with a seamless high performance 3M DST Touch system. A new class of public displays. The 46” NEC X461S and the 55” X551S are built to the highest standards and loaded with state-of-the-art innovation. LED edge lighting enables a mere 1.7” unit depth, creating installation opportunities in even the tightest of spaces. Equipped with a professional grade panel, these models deliver immaculate full HD image quality while operating 24/7. The X461S and X551S are also the first in NEC’s lineup to support Intel’s Open Pluggable Specification (OPS), the first industry-wide standardization in option slots, simplifying installation, use and maintenance of digital signage. Tech Global Inc. has extensive experience in operations and manufacturing spanning LCD, LED, touch screen technologies, Modular Architecture, Electronics, Plastics, Metal and Glass. We provide high quality commercial interactive LCD & LED touch screen solutions. James Rocheford current President and CEO established Tech Global, Inc. in 2004. Since 2004, Tech Global has been a leader as an interactive touch screen solution company. Tech Global, Inc. integrates small & large format OEM monitors with touch screen technology. The large OEM’s have integration partnerships with companies like Tech Global since they do not manufacturer their own touch screens. This partnership gives Tech Global a certified backed 3-year warranty on every OEM product we integrate touch solutions into. Tech Global’s products have undergone extensive electronic manufacturing testing and UL certification. 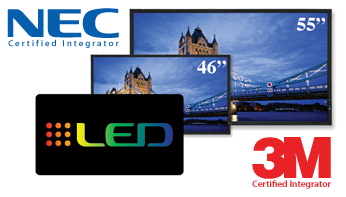 NEC & 3M Certified Touch Screen Integrator! Touch technology is ever present in our daily lives with mobile technology acting as the catalyst. This widely adopted interactive touch technology and user interface has a wide range of application in almost every vertical. • Available for display sizes 46” & 55"
Product Description: NEC, LG, Samsung, Sharp & Dell “Touch Screen” LCD & LED monitors.